CardMonkey's Paper Jungle: Rumple Ribbon Thursday - Easter Bunny Parade! Rumple Ribbon Thursday - Easter Bunny Parade! I printed the sweet image onto EZ-Blend Copic Paper and went to town, coloring this fun image. I trimmed it up and rounded the corners. Next, I inked the edges using CTMH's "Cotton Candy" Exclusive Inks applied to a CTMH ink dauber. Next, I punched semi-circle cuts at either side of the bunny, using a Sew Easy Ribbon punch. I thread through the slits some sweet Rumple Ribbon (this one's from the Panther Pink On the Edge Collection), and tied a bow. I mounted the image onto a piece of pretty scrap paper, and then onto a 4x6" card I'd made using CTMH's Daisy White cardstock, using foam tape for dimension. 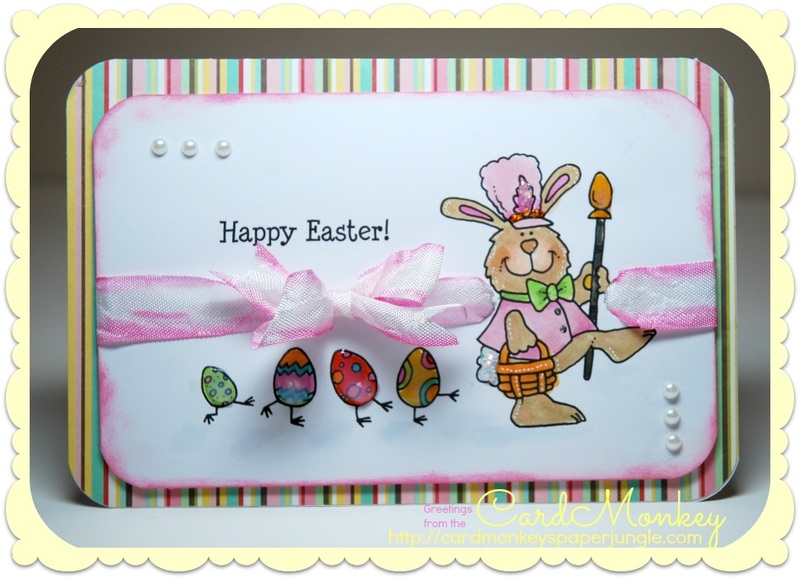 Finally, I embellished the parading eggs with CTMH Liquid Paper and dashed on some CTMH pearl gems. Ta-dah! All done. So cute! The on the edge rumple ribbon and edge distressing on the card are the perfect combo! Awww....I love this card,and I love to color with copic markers!! I will be following your posts for great inspiration!! "Happy Easter! This is adorable! Happy Easter!! Absolutely the cutest! I love it! Erin Go Bragh - a Cute Treat Box!